Xanthelasma are yellow fat deposits that occur in the thin eyelid skin. Sometimes they are caused by an elevated cholesterol and may be linked to smoking. Since it can be difficult to find a physician experienced and comfortable with dealing with these, we are used to fielding inquiries form across the continental USA. When the diagnosis is in doubt, an initial biopsy may be covered by insurance. Complete removal, however, is a COSMETIC procedure. We charge $150 for a test treatment, and then schedule 8-weeks-later at $350 per eyelid per session for office removal. Small to medium lesions are removed in a single session. Larger lesions may take two session. Unless you have a single small lesion, your treatment will require a test treatment. We have developed and used the radiofrequency excision technique for many years, but now use a gentler Waterlase method. In the office, a small amount of local anesthetic is injected. The procedure takes 5-10 minutes. Healing usually takes 2-3 weeks, and it takes 8 weeks for the redness to fade. No stitches are used. Photos show lesions before excision, immediately after excision, and final result. You can expect the final healed result to likely be only slightly noticeable and easily coverable. 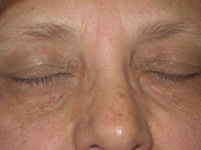 We are standardly using Waterlase laser xanthelasma removal. This can be performed without local anesthetic in some patients, but anesthetic injection is better for most. Click here for a video of Dr. Khan performing this procedure.